This project’s objective was to trial several (6) weed management techniques in a matted row strawberry system including Integrated Weed Management (cultivation and herbicides), Cultivating, Mulching (middle row with either Industrial Hemp or Landscape Fabric), Herbicides, and Particle Weeding. Particle weeding is a new method developed by Sam Wortman, University of Nebraska, which uses air-propelled abrasive grits to kill small weeds within a crop row. For this project we built a trial size air-propelled abrasive grits machine using an air compressor, grit hopper and meter, and nozzle. At the end of the trial in comparison to the control (which had 10% survivability of strawberry plants) the best method was Integrated Weed Management with a survival rate of 99% for the strawberry plant and and weed percentage rate of 2% and a cost of $30 per acre. Second place was mechanical cultivation, more friendly to organic production, at 20% weed cover in week 8 and a cost of $5 per acre. More research should be done on the Industrial Hemp mulch (cost of $2.96/ft2 and 30% weeds at 8 weeks) , although costly, if produced locally in the North East, we believe there is some great potential to utilize this product for weed management in other types of organic production. The research results were disseminated to 15 growers in western NY via a field day. This project’s objective was to trial several weed management techniques in a matted row strawberry system including mulching (industrial hemp and landscape fabric), cultivating, integrated weed management (cultivation and herbicides), and particle weeding. Particle weeding is a new method developed by Sam Wortman, University of Nebraska, which uses air-propelled abrasive grits to kill small weeds within a crop row. Managing weeds in matted row strawberry production is a costly challenge. Partly because strawberries are a perennial plant and weeds with similar life cycles often become established as plantings get older. Herbicides are somewhat limited in matted row strawberries in western NY as they are a minor crop and the potential for injury to strawberries is high. Effective weed management during the first year is imperative to improve yield for the fruiting years (years 2-4). One of the main methods for weed control in matted row strawberry plantings is cultivation or pulling weeds by hand. Although strawberries are a high value crop the cost of labor for cultivation and hand pulling continues to increase reducing the profitability of this crop (Dec 31, 2017 NYS minimum wage increases to $10.40). In western NY a significant amount of the strawberries are grown using the matted row system. This is because many of these farmers grow crops near the main tourism areas in the state including Niagara Falls and Letchworth State Park and are engaging the consumer in agri-tourism activities. The matted-row system has a relatively low cost of establishment and is easier to maintain when consumers are entering a field, whereas in plasti-culture there are more chances for this mulch to be ripped or torn. Many large scale growers have switched to plasiti-culture for strawberry production which utilizes raised beds, black plastic mulch, trickle irrigation, high-density plantings, and floating row covers which increases capital inputs by $7,000 per acre +/- (Source: The Mid-Atlantic Berry Guide). Although this system has the potential to give high yields in longer growing seasons, lower yields are common in cooler areas (zones 6a and cooler, most of western NY is in zone 5 or 6). (Source: The Mid-Atlantic Berry Guide). Many of the strawberry producers in western NY are beginning farmers, most utilizing organic growing practices that want to limit the use of plastic, who are continually increasing production but continue to struggle with weed management. There are several fact sheets that have been developed for weed management in matted-row strawberry systems but many of the processes have not been tested in western NY. Cornell’s Pest management Guidelines for Berry Crops includes several weed management strategies that would be useful for growers in western NY. For farmers to see a field trial to gauge the impacts on weeds to potentially be adopted as a new growing practice in the future. Particle Weeding is a new idea being utilized in Nebraska for weed management in organic vegetable and field crops. Several vegetable crops have been used for testing this method but there is limited research on how it may be utilized in strawberry production. Northeast SARE funded a project several years ago related to weed management utilizing landscape fabric. This project includes these materials to use as a comparison. Industrial hemp is being grown in western NY and there is currently a limited market for this crop. Industrial hemp mulch is said to provide a dryer surface layer, which may help reduce conditions for weed growth. There has been limited research on industrial hemp mulch used in a matted-row strawberry system. For this project we implemented 6 treatments with 3 replications of each. Each treatment was the width of one row (4ft) and 65 ft long and the replications were spread throughout the field for land variability. The remainder of the rows were left untreated for comparison. Landscape fabric placed in row middles at planting. Industrial hemp mulch applied in row middles at planting. Prowl H2O was sprayed following planting with 1/2inch rain. This treatment would have probably been more successful had we sprayed grass herbicides at the proper time. At week 4 weed cover was about 40% and most weeds were grasses. This treatment may have worked better if Prowel H2O was sprayed originally. Landscape fabric was more costly than cultivating but about equal to cost of herbicides. Industrial Hemp mulch was purchased from a company in CA as there was no local producers of this product. The mulch was applied at 4 weeks after planting due to shipping. There was already 20% weed coverage (pigweed, spurry, lambquarter, grasses)in these areas so we decided to cultivate before we applied the mulch to start with a weed free area. At week 8 there was a lot of grass seed germination on top of the fabric from other plots. Weed coverage was about 30%. By week 10 grass coverage was significant about 60%. 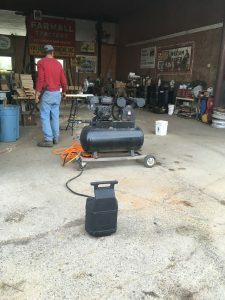 For this weed management technique we purchased a gas run air compressor and a small sand blaster. We used 3 different sizes of grit (220, 180, and corn meal). We trialed all three sizes of the grit in the sand blaster with no luck of showing physical damage to the weeds. The weeds were in seedling stage. Depending on the size of grit it kept getting stuck in the tubes before actually leaving the sand blaster. We tried several different solutions including shortening the distance the grit had to travel in the tubes but had not luck. We decided to purchase another sand blaster (Better quality and more pressure). Used the same three types of grit and could not show any difference and grit continued to get caught in the tube of the blaster. Since we could not create a decent prototype we decided to blast one plot and see if it would injure the weeds enough to set them back. It did not. By week 8 we had about 80% weed coverage. The cost to build this machine was $500 for the gas air compressor, $100 for Air blaster, and $25 for grit. For the 2nd prototype the air blaster price increase to $200. By week 8 the control plots were 90% covered in annual/perennial grasses. The survivabilty of the strawberry plants was 10%. This project’s objective was to trial several weed management techniques in a matted row strawberry system including mulching (industrial hemp and landscape fabric), cultivating, integrated weed management (cultivation and herbicides), and particle weeding. The most effective method for weed management for our project in matted row strawberry production was the integrated weed management trial. A little more costly than just mechanical cultivation and not an effective treatment method for a grower who is certified organic but weed management was significant. Next year we plan to monitor the yields based on treatment areas to see if there is any significant difference. I would eventually like to try industrial hemp mulch in a vegetable production system and see the impact it may have for future weed management in fresh market vegetables. With the new realization of weed management methods measured on our farm our strawberry yield should increase significantly and provide a more customer friendly environment for our you pick customers. At the beginning of the project a newletter article was written for the Wyoming County Ag News with a readership of 120 farmers/homesteaders. A press release was also sent to several media sources but it is unknown if they picked it up for printing. We plan to present at the NYS Vegetable EXPO in Jan 2019. 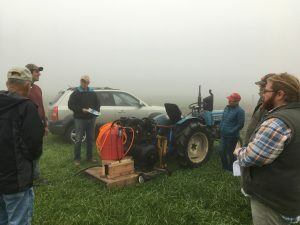 On Oct 1st we hosted our on farm field day to discuss the trial with local growers with a newsletter article to following the event. Participants review our results and explored the weeds managed within our trial. Improved quality of customer experience due to lack of weeds in our you pick field. Hope for increase in yield for following year. This project has made us realize what is the best weed management method and also gave us the ability to really analyze the weeds that germinate during the season. We also have a better guess on the costs of production for multiple treatments. Time management and cultivation timing. This project made us cultivate on a more timely routine which really benefited the growth of the strawberries. Having rain right after spraying the Prowl H2O was perfect timing. Whether this would happen again is unknown. building of the weed blaster. Do do this again it would make sense to have the original creator of this idea to help build a prototype. This method has proven to work in vegetable production but we couldn’t get the right prototype together and the weeds continued to grow so the size of the weeds may have been the determining factor. Move the control plots to an area not near the industrial hemp fabric as the weed seeds germinated on top of the hemp mulch from the weeds in the control trials. The weed control was great. With timely cultivation and herbicide application we hope to see a gain in yield next year as well. Also, our customers will be much happier picking in a weed free field. Strawberry growers in the North East and potentially organic vegetable farmers looking for weed management strategies as I think there is potential to try a trial with industrial hemp mulch in fresh market vegetable production.